‘Cake Boss’ Buddy Valastro, from the eponymous TV show on TLC about Carlo’s Bakery, has become a household name in New York. Many fans eagerly make the trip from New York to New Jersey to visit the famous bakery. That’s why, in 2013, the Cake Boss opened Carlo’s Bake Shop in New York, in the centre of Manhattan. Now fans needn’t leave the city for delicious treats. Carlo’s Bakery is a small bakery in Hoboken, New Jersey. The bakery has been around since 1910 and was acquired by the Italian-American Valastro family in 1964. Carlo’s Bakery is a family company where the whole Valastro family works, lead by fourth-generation pastry baker Buddy Valastro. Carlo’s Bakery has been featured in the reality-show “Cake Boss” on the TLC channel since 2009. In the show you can see how Buddy, together with his four sisters and three brothers-in-law run the Bakery. In each episode Buddy and his team create breathtaking cakes for weddings and themed cakes for special occasions. I’m not talking about cannoli but marvellous creations – some are meters high with moving elements. When I got married we also had our wedding cake made by the one and only Cake Boss. The results were as expected and, more importantly, very delicious! The bakery in Hoboken has become a tourist attraction thanks to the TLC show. In addition to beautifully designed cakes, Carlo’s Bakery also makes other treats such as Italian pastries, cupcakes and cookies. The store is open daily from 07:00. Carlo’s Bakery is in Hoboken, New Jersey, on the other side of the Hudson River. The bakery can be reached by PATH train or bus from Manhattan. A direct PATH-train to Hoboken, New Jersey leaves from 33rd Street. You can get to this station by going to 34th St – Herald Sq (subway lines N, Q and R) and walk from there (about a minute). Get off at the last station ‘Hoboken’ and walk to Carlo’s Bakery (about three minutes). Bus 126 to Hoboken-PATH leaves from the Port Authority Bus Terminal (42nd Str & 8th Ave). Get off at the stop Washington St – Newark St and walk to the bakery (about a minute). The bus takes around 30-40 minutes. Do you want to pay a visit to Carlo’s Bakery and combine it with a few other New Jersey sights? Then book this tour! The bus departs Manhattan for New Jersey and stops include, among others, Carlo’s Bakery (where you will have time to enjoy Buddy’s creations), Frank Sinatra’s house and the Empty Sky Memorial with a beautiful view of the New York Skyline. 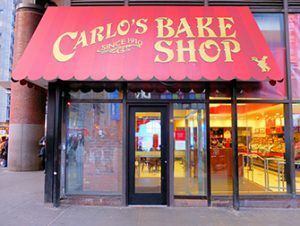 Thanks to the success of the TLC show ‘Cake Boss’ and the popularity of Carlo’s Bakery, in early 2013 Buddy Valastro opened Carlo’s Bake Shop in Manhattan. Sit down at one of the tables in the cozy café while you enjoy your purchases. Carlo’s Bake Shop also sells Carlo’s Bakery specialities in addition to coffee and tea. Carlo’s Bake Shop is opened daily from 07:30 to 24:00. Carlo’s Bake Shop is on the corner of the Port Authority Bus Terminal. The café is centrally located and is about an eight minute walk from Times Square. Carlo’s Bake Shop is also easy to reach by subway. Get off at subway stop 42 St & Port Authority Bus Terminal. Subway lines A, C and E stop here. The bakery can be found at street level. One of the specialities are most definitely the cannoli. A typical Italian pastry made of a rolled up cake filled with delicious cream. You should also try the Lobster Tail. A similarly filled Italian pastry in the shape of a lobster tail. The Lobster Tail is Buddy’s Pick, so you know it’s going to be a good one! There are also lots of other cookies, cakes and pastries available.You’ll have a mouthwatering experience picking one of the treats in the display cases. Chocolate Chip Cookies are available from $1.50 at the Carlo’s Bake Shop. If you like a good pastry shop, or a big fan of the Cake Boss show and Buddy Valastro then I definitely recommend paying a visit to Carlo’s Bake Shop for one of their famous cannoli, for example. One of the great things about the Carlo’s Bake Shop is that you can see the kitchen, where everything is made, from the outside. The store is extremely popular and it can be busy during the day. I would therefore advise to go as early as possible.